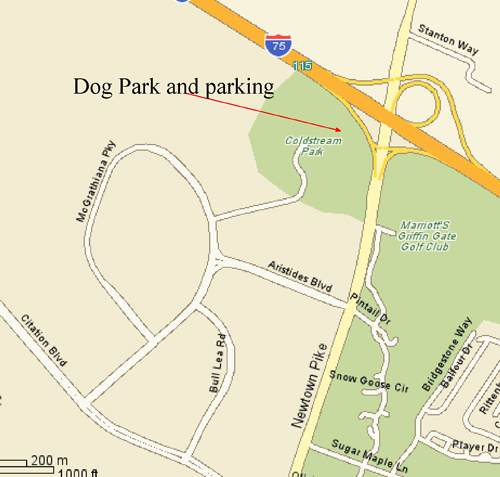 Coldstream Dog Park is located within Coldstream Park off Newtown Pike, behind the Embassy Suites. You can enjoy a full 12 acres (divided into 2 paddocks) enclosed in a horse-farm style fencing with mesh backing. There are small trees & installed benches. This is currently our only dog park with a separate paddock devoted to small dogs. We are in the process of getting quotes now to add a water fountain / hydrant. We expect this to be installed in September 2012! Take your first right, onto Aristides Blvd. You’ll pass the Embassy Suites on your right. At the end of the boulevard, turn right onto McGrathiana Pkwy. Take your next right into Coldstream Park.